Nanalulu's Musings: Fun Valentine Food Ideas - Valentine Parties! I bought the tulip toothpicks to use as arrows, I also bought the heart ones, too cute! Chocolate Covered Strawberries are pretty easy to make, and everyone loves them! The next three ideas come from Disney's Family Fun Page. They really have some cute ideas this year! watermelon and oranges, how sweet! I hope these ideas inspire you a little bit! Have Fun!!! 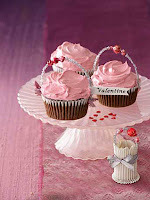 Be Sure to visit our website for beautiful Valentines & More!